The Color challenge was to use So Saffron, Pumpkin Pie and Bashful Blue. I found it a little difficult using these colors together but that is why they call it a 'challenge'. I do, however, really like the out come! 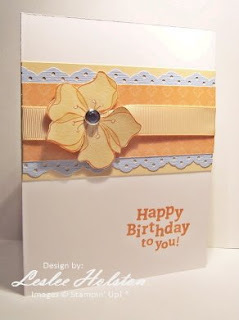 Being the CAS challenge (CAS stands for Clean & Simple), I wanted to simplify the card by eliminating a layer or two. Also, I used different stamp sets. Not that I don't like the One of a Kind Boho look, I just needed a feminine birthday card and the Embrace Life set hasn't seen much ink lately. The flower is stamped in Pumpkin Pie on So Saffron card stock. I used the So Saffron marker to give the flower a little extra color (tone on tone). It's a nice subtle effect. 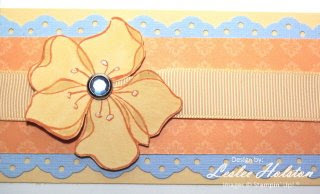 This card is pretty simple...three layers, ribbon and a focal flower. The sentiment is stamped in Pumpkin Pie. I used the Birthday Wish stamp found on the 'Under $10' page of the SU! Spring-Summer 2009 Catalog (page 208). I really have been reaching for this stamp a lot lately. It's both masculine and feminine and totally fun! Thanks for stopping in today. I hope you've been inspired to 'make over' one of your own creations. Sometimes, we just need a 'do over'!